Men’s 100% silk boxers by Royal Silk® in a superb design of tiny abstract blue chips on a ground of rich navy. Made of light, soft, and fluffy Mulberry Silk in 50gm weight. The relaxed elasticized waist allows for an easy, comfortable fit. Available for waist sizes: S (30-32"), M (33-34"), L (35-36"), XL (37-38"), 2XL (39-40"), and 3XL (41-42"). 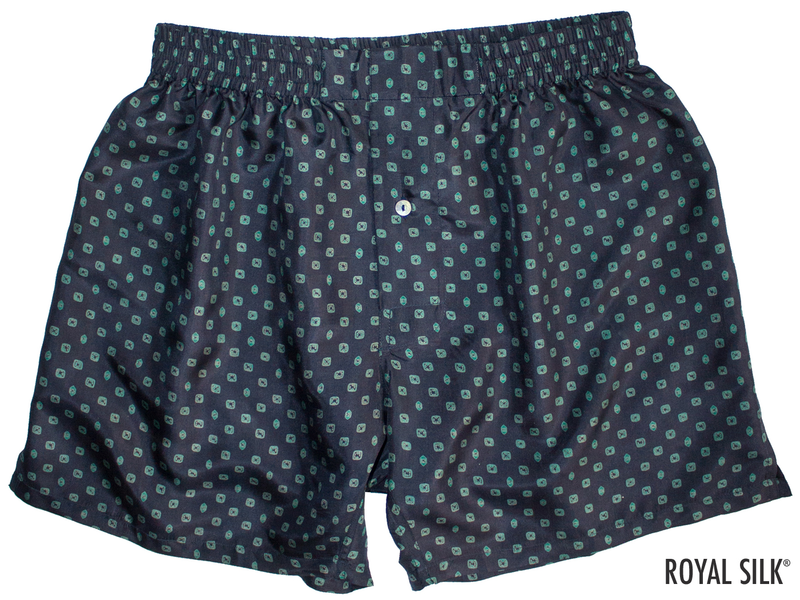 The boxers are full cut with lengths ranging from 16.5" to 17.75" for sizes S to 3XL. Inseams are about 5.5" for all sizes. Three-panel construction allows for roomy comfort. Full-sized fly front with single-button opening. Single-button fly closure features 0.5" mother-of-pearl button. Extra button included. 100% silk boxers. Imported. Hand wash or dry clean. Or safely machine-washed using our highly-rated, made-in-USA laundry bag for silks that is available in two sizes and purchased separately. $39.